Role-playing in Hungary does not have a particularly long history. It is telling that people who had started in the early 1990s are considered veterans of gaming, a generation which would barely count as neophytes in the US or the UK. More than that, we know little of that early gaming period. From the first groups in the mid-1980s to its first boom of popularity in 1990-1992, precious little material evidence has remained. By all accounts, people had fun playing (mostly) AD&D, and photocopied translations were circulated among fans (the best known version being The Ruby Codex), but the publication of homebrew materials was minimal, or at least extremely limited. It was a different time: photocopiers were hard to access, and home (or even workplace) printers were expensive equipment mainly found in research institutes and universities. Therefore, we cannot really speak of an age of fanzines, nor extensive home publishing. I know of (and own) one homemade module which was available at the time: The Great Pyramid, a mid-level dungeon whose themes and ideas should be hardly surprising. 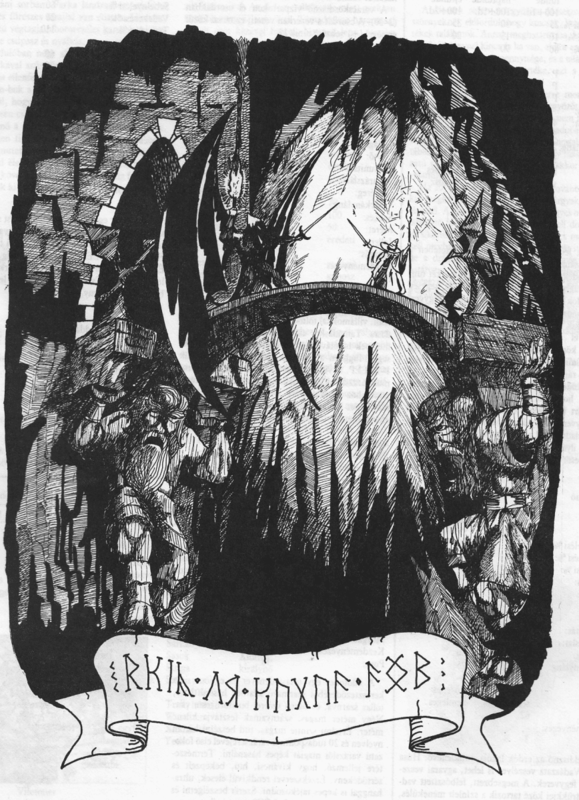 Without external support, game groups had to make do with what they had: a few fantasy novels (Tolkien, a dash of Conan, and some disreputable but fun pulp literature), the occasional photocopied game supplement they could get from other groups, an increasing number of computer games, Fighting Fantasy, and their imagination. The results were varied, from the deadly dull to the quite imaginative (or at least somewhat original). One of these results is Combat and Magic [Harc és Varázslat], the first Hungarian RPG, whose brief appearance and fast downfall went mostly unnoticed at the time. But not by all: this was the first “real” RPG I ever played (after a systemless dungeoneering game at the Scouts I then believed to be an innovative sort of puzzle), and I still have good memories of the experience, even though in my first adventure, my nameless Fighter went down into some mines and got summarily killed by orcs in one of the first encounters. I barely knew what hit me, but I was hooked! Thus, this post: part reminiscence, part a look at a game that’s both utterly predictable and compellingly oddball, a product of a naïve fascination with fantasy literature and an exciting new game form. Combat and Magic proudly wears its influence on its sleeve. 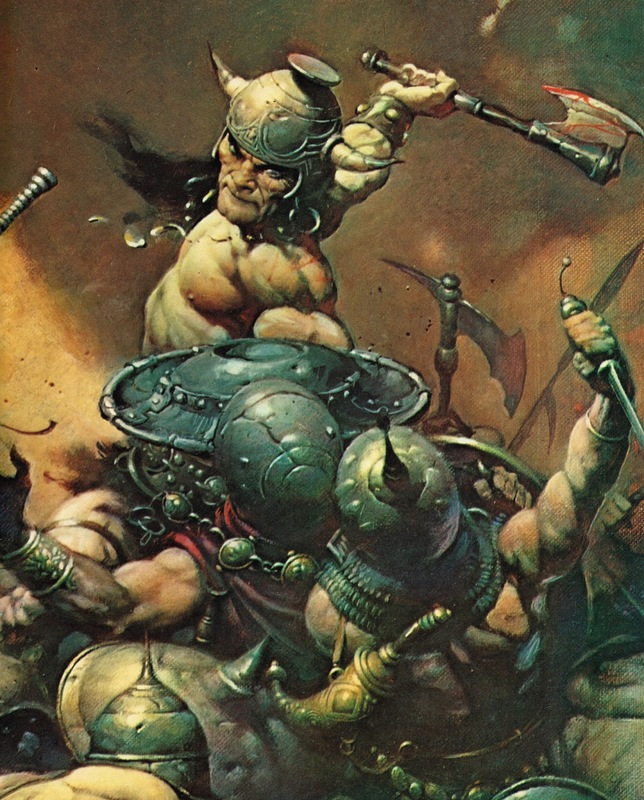 The cover on the players’ booklet is graced by a notoriously bad rendition of Frazetta’s Conan the Destroyer fighting some lizard-things, while the Storyteller’s booklet depicts a scene right out of Tolkien, an adventurer menaced by something that looks like a ringwraith. 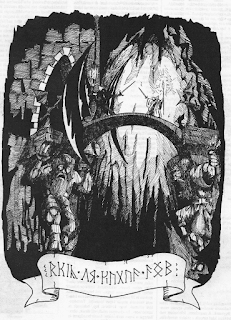 The Conan-meets-LotR theme continues through the entire game in a strange manifestation of schizophrenia – sometimes the game has its semi-naked amazons, war galleys and buff fellows in leather gear holding various murder implements, and sometimes we are in Moria or Rivendell (and not a homage either: it is clearly Frodo and Co. investigating the tomb of Balin, facing the Balrog, or finding the mountain door). As the introduction proclaims, “You have surely read J. R. R. Tolkien’s exciting book, The Lord of the Rings. This game leads you to a similar world, and you can live there, adventuring among the creatures of fantasy. You can meet goblins, elves, dwarves, dragons, and you only need a little imagination... If you like our offer, forward to adventure! You are awaited by the forbidding lands of the unknown world, its cities and peoples! Your imagination will wander the land of fantasy, the world of DRAGONFLAME...” In a charmingly earnest way, it goes further – the back cover of both rulebooks reproduces the cover of the Mentzer Set, the caption reading “The cover of one of the American fantasy games similar to Combat and Magic”. Similar indeed! 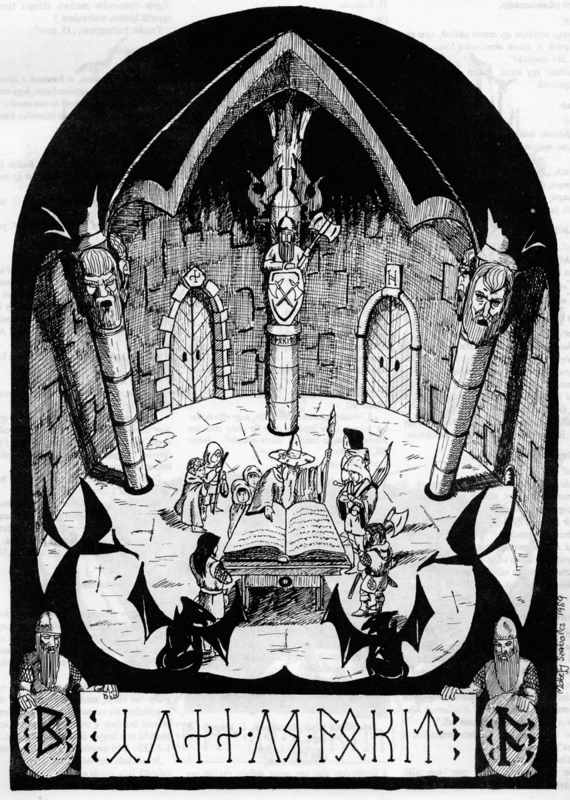 Interestingly, just like Original D&D was billed as “Rules for Fantastic Medieval Wargames Campaigns”, Combat and Magic is called a “Personality Game” (and on at least one occasion, a “Cooperative Personality Game”), and not an RPG – no common local term for RPGs having been accepted yet. The game, not surprising considering its AD&D roots, uses seven attributes, but measures them on a percentile scale (Intellect, Strength, Agility, Speed, Endurance, Manual Dexterity and Physical Looks). Yes, they are rolled with entirely random 1d100 rolls, in order, no takebacks. Or as Vorg tells us: “Let us begin, and may the gods guide your hand!” These attributes provide modifiers for a whole lot of secondary values from combat ratings to poison resistance and the ability to read and write (Vorg, with a Manual Dexterity of 8%, is completely illiterate, and his 14% Physical Looks is fairly dire – but he has an impressive 92% Strength). Some people say chicks dig scars, but this is clearly incorrect on the world of DRAGONFLAME: when you receive face wounds in combat, your rating drops pretty substantially. On the other hand, chicks receive a 1.2 multiplier to their Physical Looks because “If your personality is a woman (…) you take better care of yourself and your beauty.” On the other hand, many other modifiers are fairly moderate, and much of the attribute range does nothing whatsoever or very little: there is, for example, no difference whatsoever between an Endurance of 26 and 70. The three alignments (Good, Evil and Neutral) are followed by the character races: Humans, Elves, Dwarves, Goblins (here mostly thieves and wizards) and Orcs, set apart by ability score modifiers and limits (e.g. Orcs have a maximum Intellect of 60, get +15 on their Endurance, but -15 on their Manual Dexterity) and the occasional modifier to specific weapon types. Furthermore, Elves can sense the presence of the freshly slain dead, and see wandering souls, Dwarves see in the darkness and can withstand extreme temperatures; Goblins are stealthy; and Orcs almost never get lost in the wilderness. Actually, “Goblins” are probably meant to be hobbits, since they live in covered pits close to the earth, and have a democratic worldwide government run by a hidden ten-goblin council. Combat and Magic has a fairly weird Vitality system: every character starts with 100 Vitality, plus race-based dice (Elves have 1d10 more Vitality, Humans, Goblins and Orcs have 2d10 more, and Dwarves have 3d10 more). At 0 Vitality, you are dead. However, the system also has something called Damage Absorption Percentage (DA), which starts at 20% of your character’s full rating, and goes up 2% every level, up to 38% (Fighters also gain a one percent bonus per level, but none of the other classes do). Should you receive more damage than this percentage, you fall into a comatose state, where you bleed out at a rate of 1 Vitality per wound per round – only healing can bring recovery. In practice, your average longsword does 1d10 damage, a staff does 1d5, and a cavalry lance – the mightiest weapon – does 1d10+10, so a few successful hits can dispatch even a relatively hardy character. As an obvious AD&D legacy, saving throws (or their equivalent, “Chance Rolls”) also exist as three flat percentile ratings to escape the effects of poison, magic, and dragon breath, respectively (although dragon breath, an oddly specific choice, still causes half damage). The real rating which matters is your DA: it is not entirely clear why the ridiculously high total Vitality is used at all. Fighters learn to use multiple weapon types, and have slightly better combat values. Noble fighters (player’s choice to try for a 75+ percentile roll) get training with more kinds of weapons, but suffer a small Endurance penalty. 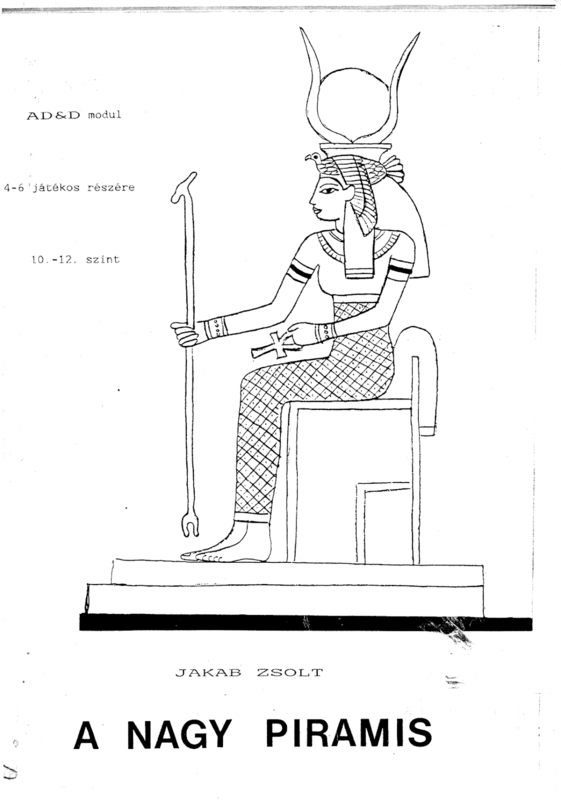 Nobles also have to abide by a code of conduct: they may only attack a woman in self-defence, they must always attack from the front, and they may not use poison (“except evil nobles, because they are capable of it”). Even evil nobles, as we learn, “Follow etiquette, and only rarely have their captives tortured – and never by their own hands.” Their commoner counterparts start with a small penalty to either mounted or footman’s combat, which they “grow out of” by level 5. Trackers are skilled hunters, who either work alone, or as guides to travelling companies. They can call an “animal companion”, with one attempt possible per level (if it is a failure, the beast attacks). A tracker must avenge and mourn two years for a companion if it is ever slain before calling another. They also have versatile wilderness skills: tracking, speaking with animals, hiding, and recognising traps. Priests are spellcasters, who, unlike fighting classes, can only gain levels by returning to their churches, where they are also required to donate all their unneeded money. Priests are either Good or Evil, but never Neutral (this will become important a bit later). They are not limited by weapon type, but only know to use a few of them (up to 4, while a Fighter would start from 3-4 and proceed from there). Priests can contact the gods directly for advice and help. 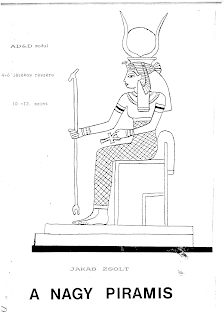 They also have a bunch of different abilities based on the specific god they worship, who are quite varied. 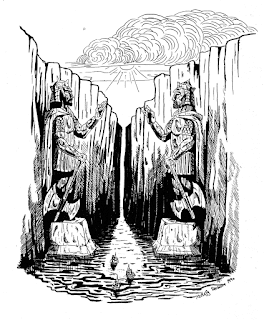 The followers of Perlin, goddess of dreams and fairy tales (Neutral, Priests can be either Good or Evil) can perform divinations, but they must regularly interpret a dream as a form of sacrifice; meanwhile, the Priests of Dorl, god of earth (Neutral, Priests must be Good) have a special spell to hurl pebbles, can sense buried items under their feet, but they must bring home a clod of earth from every land they have visited, and can only use bludgeoning and cutting weapons. Mages aren’t D&D’s physical wretches (having lower, but still passable combat abilities and Vitality), although they are limited to daggers and staves, and must not wear armour. They must return to their master to gain levels. Mages belong to one of two schools: Moonlight Mages are Good, and practice white magic; while Grey Mages are Evil, dealing in black magic (these orders also give their members assistance if they show the correct hand signs). Mages sense other spellcasters in a 10 metre circle. After you determine your class, you must also roll for social status. This is another flat 1d100 roll,: you may start with 40 copper pieces as a “free homeless” (1-14), 1 gold piece as a servant (15-29), 75 gp as one of the “famed” (75-84), or 1000 gp as royalty (00). For reference, 10 gp is the price of a longsword, while for 1000 gp, you get a suit of plate mail. Like true-blue old-school games, there are no skills in Combat and Magic. However, your character may have a profession, unless you are a noble fighter, because work is beneath nobles. Your choice of profession depends on your social status, your ability scores (with some racial bonuses and limitations), and your class. Here, Combat and Magic again delves into the oddly specific, letting you play a more conventional healer (restore up to 10 Vitality per week), sailor (you can navigate ships) and thief (you get the thief skill), or professions like a gravedigger (you recognise religious symbols and tolerate the stench of the grave), executioner (you can easily kill restrained victims) or miner (you don’t get lost underground). Your profession is, once again, rated at an utterly random percentile value, which never, ever improves. You might be the best weaponsmith out there with a 100%, or you can be a random fool who drops the hammer on his feet with a 3%. In each round, characters must decide to either attack their opponent or forego it and defend themselves. Initiative is a simple d10 roll for your whole group. Your Attack % is used to figure if you score a connecting hit. Armour (if any) can stop a blow outright, based on a matrix cross-referencing five armour types (leather, studded, chain, scale and plate) and three weapon types (piercing, slashing and bludgeoning) that’s reminiscent of AD&D’s infamous weapon-vs-AC chart. For instance, chain is 25% vs. piercing, 50% vs. slashing, and 35% vs. bludgeoning. If a hit is scored, but the subject has chosen to defend himself instead of attacking, he can still roll a successful Defence % to avoid getting hit. Many weapons grant a bonus to Defence %, from 10 (daggers and hammers) to 15-20% (most swords and maces) to 30% (polearms), and you also get some from shields (10% or 20%), but you must choose whether you’d like to defend with your weapon or your shield. If neither form of defence succeeds, you get to roll damage, which, as previously noted, can be pretty dire. This system comes with a fair whiff factor, although Defence % tends to be fairly low, and if you know enough weapons, you can use one which gives your opponent a lower Armour roll (it pays to stock up on different weapon types). Although the Storyteller’s Booklet is dedicated specifically to running the game, and players are admonished to avoid reading it, it starts with a brief world guide that would probably be a better fit for the main rules. 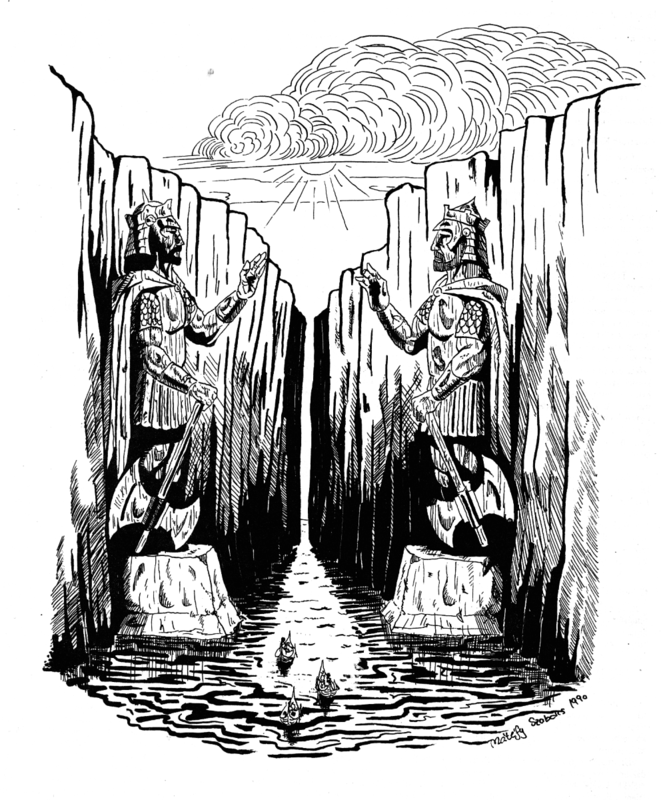 The world of DRAGONFLAME (no longer capitalised here) is a naïve fantasy mishmash, but it has its own creation myth, and a huge, active pantheon of gods with quite silly names (Kayar, Zomur, Serlafor, Zorikon, Xirfon etc.). 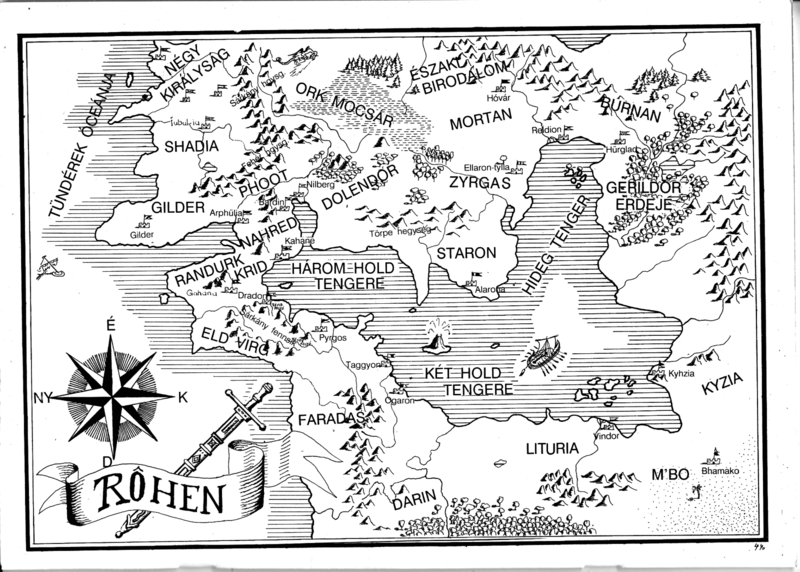 The planet of Rôhen (note the Tolkienesque diacritic) has three continents, but the game is focused on one called, appropriately enough, Draco, and specifically its north-western corner called the Four Kingdoms. 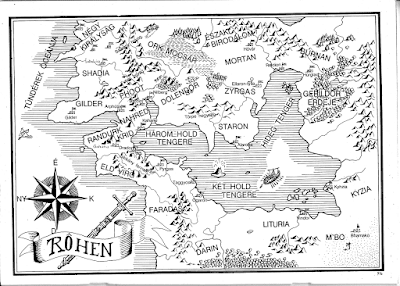 To keep with the tone from the LotR appendices (the definitive model for fantasy world-building in early 1990s Hungary), Draco’s history is punctuated by a lot of blood and thunder, like “the Second Metal War”, “the rise of Tarrakis, Lord of Darkness” (he had the Twelve Knights of Death on his side, but was eventually driven out of the known world), “the foundation of Divide” by King Farseer the First, “the imprisonment of Agay Khenmare of the Threadbare Cap and eight demon by the Moon Mages”, and “the Second Dragon War”. 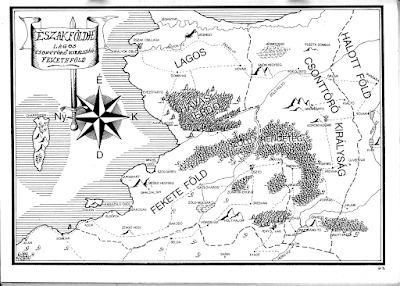 Draco’s geography is no less fancy, with a giant inner sea (divided into the Sea of Three Moons, the Sea of Two Moons, and the Cold Sea), and a bunch of doggerel toponyms like Faradas, Eld Virg, M’Bo, Búrnan and the Forest of Gerildor. However, the published game is focused on the so-called Four Kingdoms, to the north of Shadia, and east of the vast Orc Swamp. 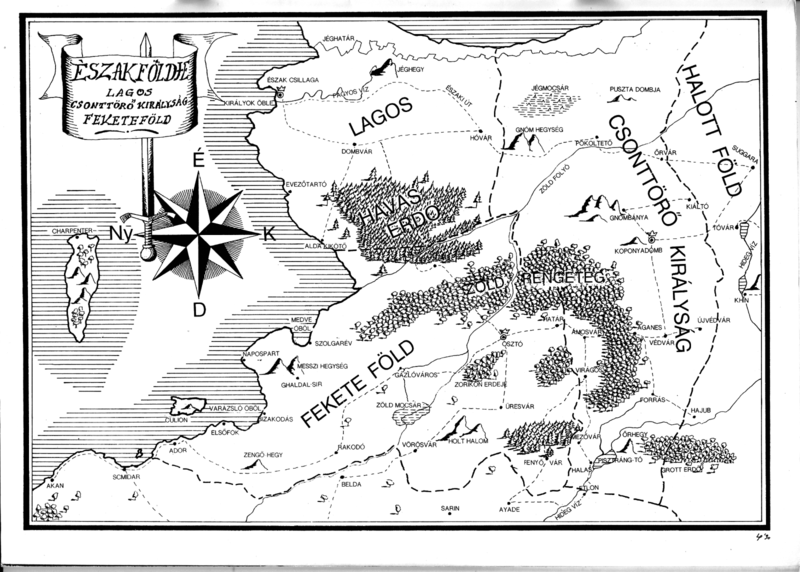 Actually, only three of the kingdoms are nice places to visit: the Kingdom of Black Land, the Kingdom of Lagos, and the Bonecrusher Kingdom, whose ruling dynasty has died out, and left behind a war of succession (the most likely successor, Ed Morrison, lives in the town of Helltop; the capital city is named Skull Hill, but the kingdom is actually a fairly normal place with a sheep-based economy). This is less true about the Kingdom of Dead Land, whose southern part is a confederation of independent mercantile towns, but the north has been taken over by bandit gangs lead by the evil wizard, Agay Khenmare of the Threadbare Cap. This mini-setting is quite charming in its own way; half Tolkien, half AD&D, but with the Northwest-European cultural references exchanged for a decidedly Hungarian perspective. This is quite intriguing, since the Hungarian fantasy genre, and Hungarian RPG fandom in specific has shied away from its own history and culture. It is still a European mishmash ranging from Finland and France equivalents to something feeling a bit like fantasy Ukraine (with NPCs named Pierre Vandel, Oleg Isakov, Stefan Schaller, Valdemar Kanagas, Commander Tony Elton, and Arnold Denman), but there is something almost indescribably Hungarian about the land’s large plains, agricultural towns and, above all, the slightly rustic tone of its place names. As strange as it sounds, this familiarity is the strangest thing about the whole Combat and Magic experience, because nobody has ever tried anything like this again – Hungarian fantasy has focused on discovering the fantastic in distant lands, to the neglect of our own. The Vilotoner is a mixture between a huge eagle and a bat. It is very intelligent, able to converse in three languages, and cast Wizard spells. It is curious, vain, egoistic and easy to offend. There is some decent guidance on setting up and running a game (actually, more than many subsequent Hungarian games, which often wouldn’t think too deep about the question), and a bunch of Storyteller-specific rules, but the other big interesting thing about the booklet is the example scenario, The Dragon of Singing Mountain. 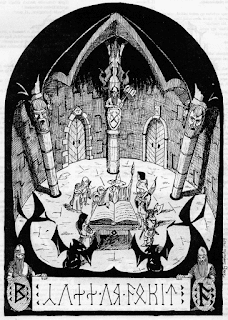 Nothing less than a three-level dungeon, it is a tutorial for both the players and the Storyteller. You have to defeat a dragon and save a kidnapped princess – but before that, you have to get through the caverns of Singing Mountain. The caverns – really dungeons – are mostly linear, and the action largely features combat and basic exploration. You get to fight morlochs, dog-headed men, a wererat, skeletons, zombies, black dwarves, and an evil wizard. There is an underground smithy, an evil temple (the idol has gemstone eyes and a poison gas trap), a mirror room, a plant room (with life-draining plants), a library and a well, but disappointingly, it lacks the wahoo nature of some of the rulebooks..
What is interesting is how the adventure starts in a way that explains everything to the Storyteller, with a choose-your-own-adventure structure and readout text, and starts to hand over more and more responsibilities as it goes on. The first level is full of handholding, but halfway through the second, the room descriptions become sparse outlines to be filled out on your own. The third level, with a deep, dark underground lake, is only described in brief and left to your development: here lives Tungar the Dragon in an island tower, there is an old orc Priest who serves as the ferryman, and other mysteries are also in evidence. Is Combat and Magic a good RPG? Not really. It is simultaneously awkward and simplistic, with fairly fiddly rules to realise simple concepts. 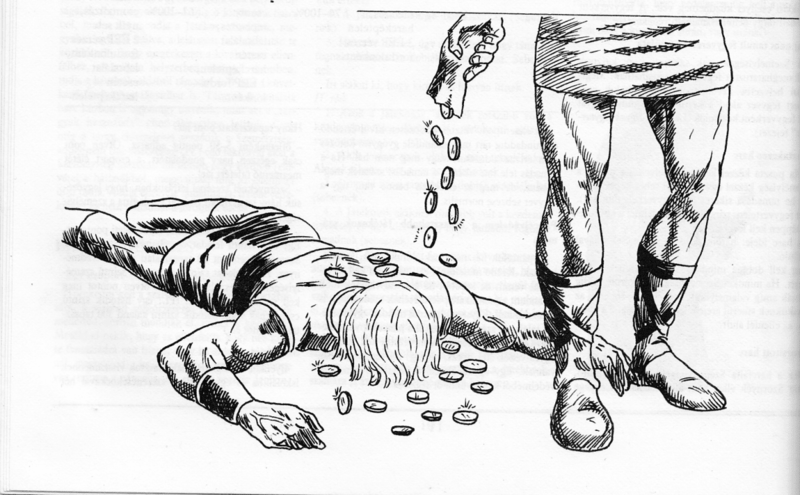 The character generation is more complicated than in AD&D for less mileage, and the combat system has its awkward spots. There are puzzling ideas, like the Vitality/Damage Absorption concept. I don’t think many people had played by the book – I am pretty sure we didn’t, because the combat I remember was far deadlier than the baseline. I do not count the game’s high randomness as a design mistake (although many people in the 90s would, if they had even heard of it); it is endearing and almost feels fresh in our day. In practice, all those flat 1d100 rolls would tend to even themselves out, and your character would have a few areas where he would be better than the others (at least I don’t remember my PC being overshadowed, which definitely did happen in our attempt to play M.A.G.U.S.,the second Hungarian RPG. Seen through modern eyes an incredible 27 years later (has it really been that long? ), the areas where Combat and Magic feels fresh is the enthusiastic spirit of adventure, the way it embraces the fantastic, and the way it tries to make most of a very narrow set of influences. It owes a lot to The Lord of the Rings and it owes just as much to AD&D, but there are a few things there which are beyond imitation. Why did Combat and Magic disappear from the public consciousness, so much so that most gamers have never even heard of it? 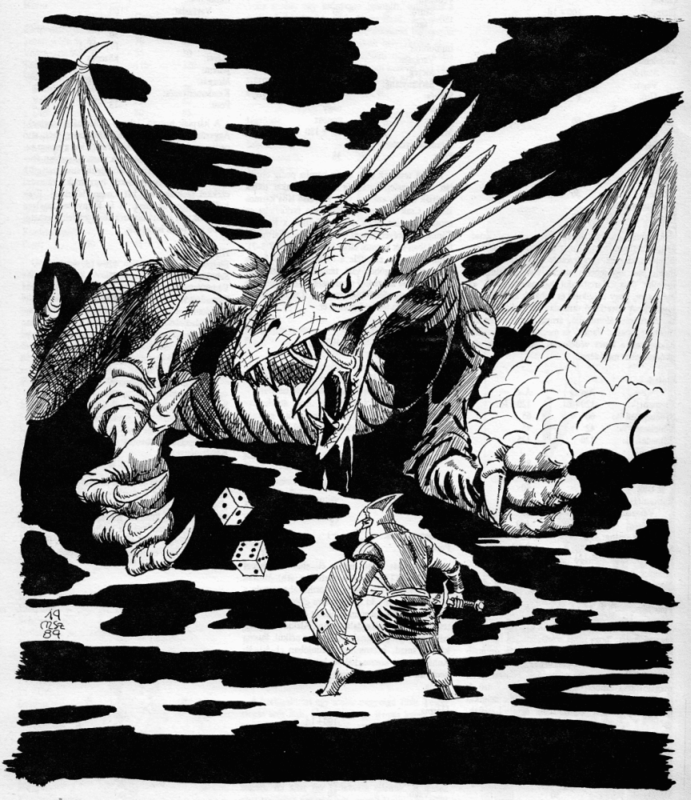 In a way, it came too early, at a time when there were no established communication channels for roleplayers yet – no magazines (the first would come out late 1992), no fanzines, only two game stores in the entire country, and often little contact between the isolated gaming groups out there. Interestingly, the game was by no means unknown. I know multiple people who have started with it, usually for a few months before they would find their way to AD&D (either the bootleg translations or the real deal). It was also a mainstay at a few game clubs; apparently, fans in the city of Miskolc had come up with multiple typewritten fan supplements and their own shared setting (“Sword World”). 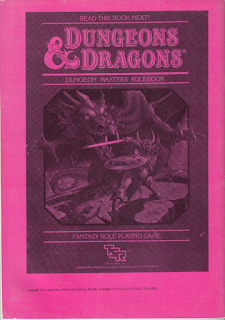 Combat and Magic had sold well enough to merit a follow-up, and its creators had ideas to bring it forward with new booklets. 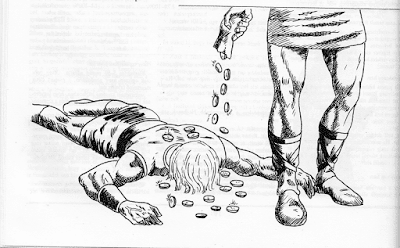 What happened to it was much more banal: the owners of the publisher, SPORTORG Ltd., had just disappeared with the money and let the company go bankrupt. It was not an uncommon way to make easy money those days – most of these cases would never be solved by a sluggish unprepared court system. It was an ominous sign of things yet to come – and as we will see from later parts of this series, far from the last case where legal issues would intrude upon the hobby. “And now, stranger, the time of farewells has come. I have told you everything I know about the world of fantasy. I bid you farewell, for I am called by faraway lands, furious battles, and by glory… perhaps we will meet again somewhere. Only the gods know. Good luck! Someone in my earliest gaming group had this, but it felt more like an amusing oddity instead of a must-play thing of coolness (the kick we certainly got even from thumbing through TSR catalogues of the time) even by 1992 standards. We had our reams of photocopied 1st ed. AD&D stuff by then. 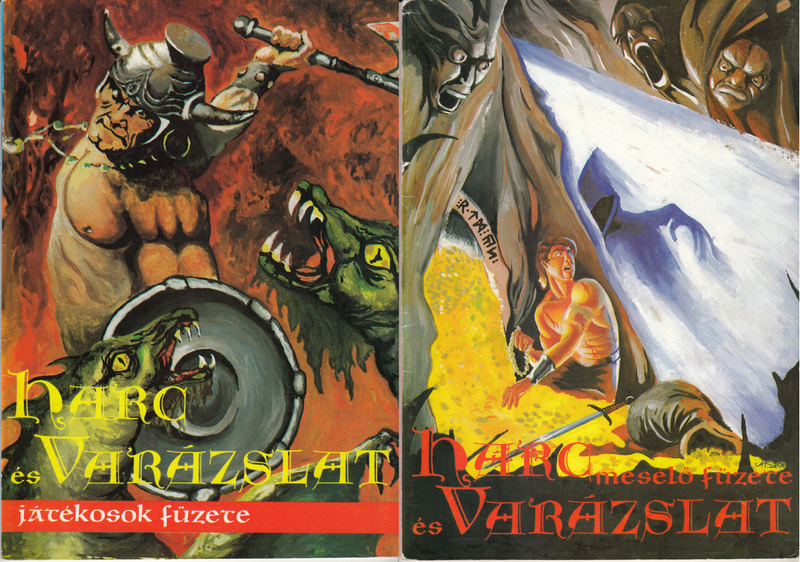 Btw I don't think that the Hungarian fandom "neglected" our roots, quite simply because we lacked anything resembling the rich soil of pop-culture trash and pulp fantasy lit that served as background overseas, already in place for decades when the first D&D booklets were published. Also, it was just a few months ago that I had an idea of a decidedly Hungarian folk megadungeon. But more on that some other time. Looking forward to reading further instalmenta of the series. I must find a copy!